I have exciting news… I am the March Guest Deisgner for Clearly Besotted Stamps. When the owner Stephanie emailed me, I could not believe my luck! Not only are Stephanie's stamps and dies stylish and high quality, but she is absolutely lovely too. AND her Design Team are AWESOME - so many people I love and admire there. So I said a very excited yes, and eagerly awaited my stamps. And boy was I excited when they arrived. This month's release is stunning! Today's card features the Elegant Butterflies set. Warning: you are going to LOVE and want this set! 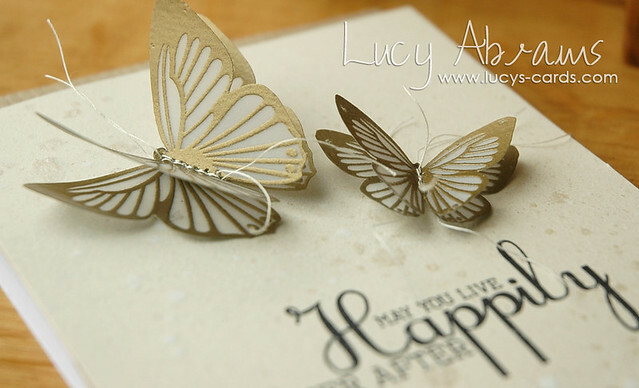 To make my card, I heat embossed the butterflies on vellum with gold embossing powder then stitched them together. I added them to cardstock misted with a load of Calico Shine and Opaque White Mister Huey's. The sentiment is also in the Elegant Butterflies set. Love the mixed fonts. I love the look of gold on vellum. So pretty. More to share tomorrow for Day 2. I created this set of flash cards for my flashcard-mad daughter with the cute Under the Sea stamp set. This girly thank you card features another gorgeous butterfly set: Butterfly Wishes Additions. I love the Basic Alphabet set - it's perfect for creating your own sentiments, as I did in this silly card. And this pun-tastic boy's birthday card features a super-fun shark die. And wanna see what's on my Clearly Besotted wish list? A few of their brand new dies perhaps? I use a LOT of tags on my cards, and this one looks FUN. Love the look of this notebook edge die… so useful. And this set of flower dies could be really really useful for making some handmade embellishments. And if you want to see more teasers, head on over to Stephanie's blog and then check out what the Clearly Besotted DT created too! Hope to see you tomorrow - happy Saturday. Absolutely gorgeous! 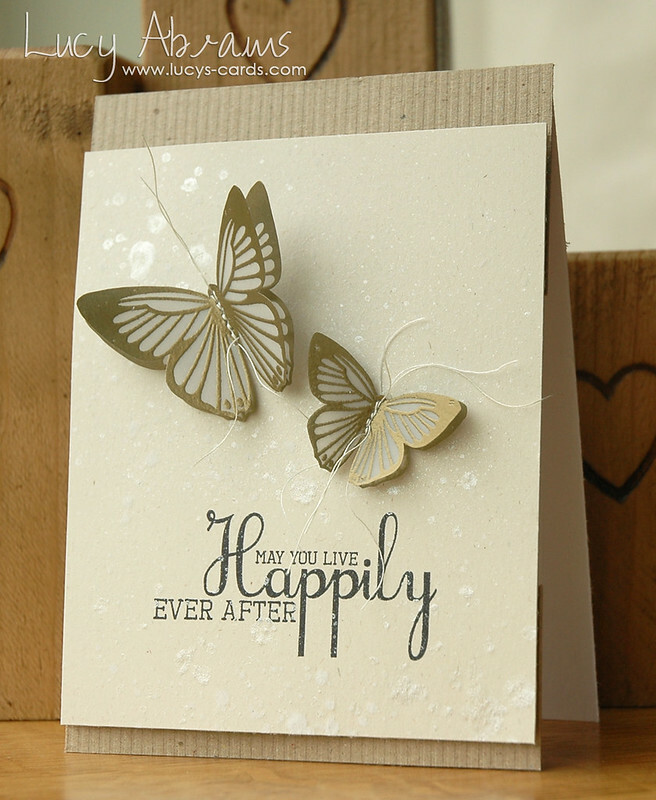 I love the vellum and gold embossed butterflies! Such a perfect card for a wedding or an anniversary. Once again congratulations Lucy and your card is great indeed that gold is divine on vellum. Ohh my I feel an order coming already. What a beauty, and so trendy, Lucy! Love it! Such a pretty card Lucy - I love the splatters (i'm really into splattering of late!!). Great to have you as our teamie this month!! Oh my! These are gorgeous, Lucy...sooo elegant! Congrats on your GD spot with CB; you work magic with Stephanie's products! Your card here: stunning! Yes, my wish list will be very, very long. Thank you for sharing links to your other CB-inspired creations. They are amazing!! Congrats! Stephanie is on top with trendy stamps and u with your trendy techniques. Perfect match. Have fun. this card is stunning! The neutral colors and the gold embossing make a perfect pair.